March 11, 2013, Silver Spring, Md. : The National Museum of Health and Medicine (NMHM) has installed a temporary exhibition of larger-than-life portraits by a New York-based artist honoring survivors of traumatic brain injuries (TBI), who became role models for their peers. The exhibition, WHACK'ed ... and then everything was different, opens March 11, 2013 in the NMHM lobby and is on view through May 2013. 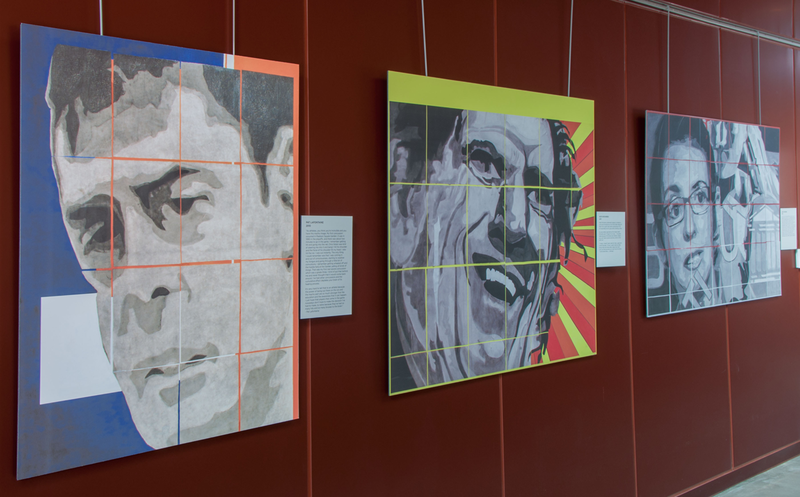 The installation opens concurrently with the celebration of Brain Awareness Week at NMHM and while the Department of Defense (DoD) is recognizing Traumatic Brain Injury Awareness Month. 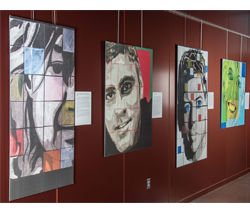 Eliette Markhbein, who is a TBI survivor herself, constructed the portrait series to raise awareness of TBIs. Her subjects include former congresswoman Gabrielle Giffords, professional athlete Troy Aikman and renowned actor George Clooney, to news correspondent Bob Woodruff and service member Claudia Carreon who was injured in Iraq. 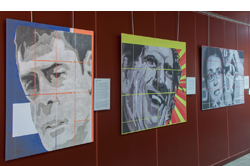 Others featured in the exhibit include National Hockey League Hall of Famer Pat Lafontaine; Alexis Verzal, a spirited 5-year-old who was shaken at 14 months; Trisha Meili, the "Central Park Jogger"; brain injury patient Timothy Pruce; and musician Keith Richards. Markhbein's unique technique is a silent testimony to the three phases of TBI: fractured, reassembled and whole. Using cropped photographs, Markhbein first draws the portrait in charcoal on paper. She then imperfectly cuts the drawing into squares and reassembles them as portraits on painted canvas. The uneven-grid effect that results from the drawing/cutting/collage technique illustrates how TBI disrupts sensory and perceptual processes. The grid also acts as a metaphor for the support and structure that TBI survivors require to live an active and rewarding life. 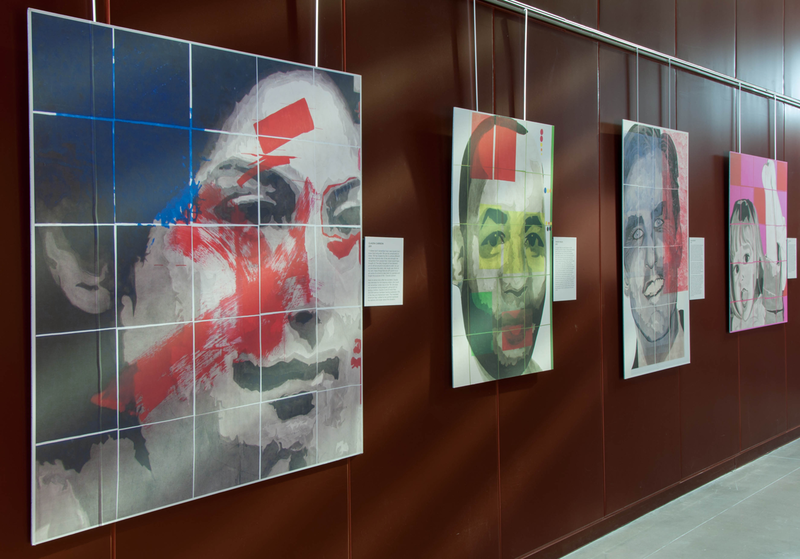 "By representing faces of TBI survivors on a large scale, I hope to elicit emotional intimacy and universality," says Markhbein. "More importantly, I wanted to show examples of brain injury survivors who moved on to have full, productive lives. 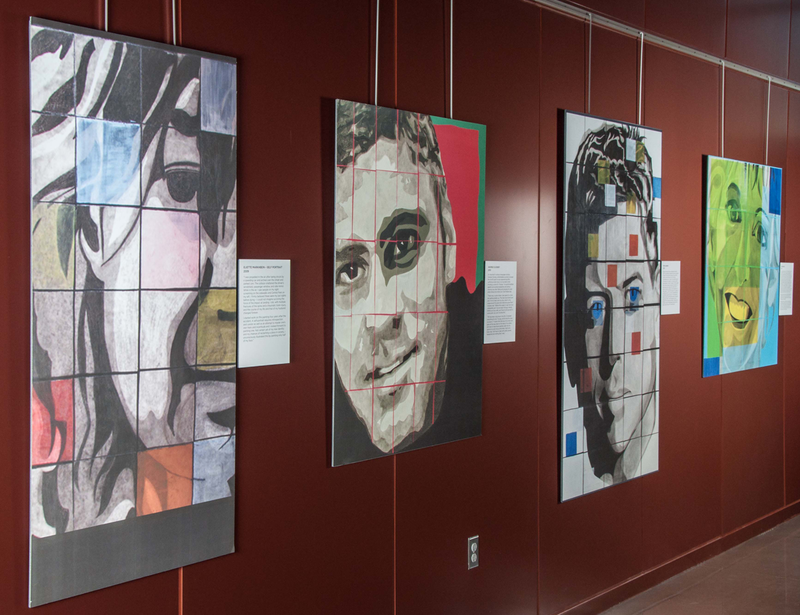 I hope the portraits offer inspiration to those recently injured: kinship and identity with such icons is a powerful emotion, encompassing pride, pleasure and self-compassion, all of which are in short supply during the rehabilitation process." "We're honored to be able share these unique portraits in the setting our museum offers especially as the Museum celebrates Brain Awareness Week and recognizes Traumatic Brain Injury Awareness Month," said Dr. Adrianne Noe, NMHM director. "At a time when so many military families are dealing with the ramifications of traumatic brain injuries affecting their loved ones, American families are realizing that this issue deserves more attention." TBI is not an unfamiliar topic to the NMHM or to the Department of Defense (DoD), which has a demonstrated commitment to preventing and treating traumatic brain injuries. NMHM is home to one of the world's most comprehensive brain collections. And proper management of TBI cases has become a military medical standard of care, according to DoD. The Department of Veterans Affairs and DoD are engaged in a $100 million research initiative to improve diagnosis and treatment of mild TBIs. And recently, the U.S. Army teamed up with the National Football League to improve awareness of TBI and increase research into its causes, prevention and treatment. National Brain Awareness Week programs were first established by the Dana Alliance in 1996, linking scientists, clinicians, journalists and other educators in an annual effort to raise public awareness about the brain and brain science. In 2000, Dana joined forces with NMHM to develop a program designed especially for middle school students. Brain Awareness Week has helped instill a sense of excitement about science, while bringing awareness and understanding of current research and its translation into clinical practice to young audiences. In May 2012, NMHM opened a new exhibit that features TBIs. The installation showcases actual human brain specimens that demonstrate a variety of brain injuries, including hemorrhages, blunt force trauma and bullet wounds. Many of the specimens featured in the exhibit have never been on display. Also included in the exhibit are medical and surgical tools used to diagnose and treat TBIs, and devices such as video games and acupuncture needles used in rehabilitating of patients with brain injuries. The TBI exhibit is expected to be on display at least through 2013. Media representatives are invited to inquire further about the Markhbein installation. Advance notice is required. Contact Melissa Brachfeld, NMHM Public Affairs Specialist, at (301) 319-3313. The National Museum of Health and Medicine, a Department of Defense museum established in 1862, inspires interest in and promotes the understanding of medicine— past, present and future— with a special emphasis on tri-service American military medicine. As a National Historic Landmark recognized for its ongoing value to the health of the military and to the nation, NMHM identifies, collects, and preserves important and unique resources to support a broad agenda of innovative exhibits, educational programs, and scientific, historical, and medical research. NMHM is an element of the U.S. Army Medical Research and Materiel Command headquartered at Fort Detrick, Md. NMHM is located at 2500 Linden Lane, Silver Spring, MD, 20910, and is open daily (including weekends and holidays) from 10:00 a.m. to 5:30 p.m. Visit the website or call (301) 319-3300 for information on tour programs and special events.